This weekend we are open as normal from 08.30am on Saturday and Sunday. This is just one of Czapla’s incredible shots of a Tandem jump. He does camera here with us in the I.P.C and his photo’s have been in magazines all over the world. 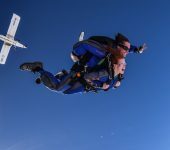 Peter Breen is one of our highly skilled tandem masters and AFF instructors, himself and the Tandem student are really enjoying their jump on a gorgeous day. The weather forecast is not too bad at the moment but at this stage we will have to wait until the day itself. We have been having such variable weather that it is simply very hard to judge it but you are better off being here to try and get your jump done. We look forward to welcoming some new faces and lets make it another great weekend.